GM Mike Mayock suggested Lynch (groin) will wait until after the 2019 NFL Draft to make a decision on his future in football, Vic Tafur of The Athletic reports. Analysis: Both parties seem content with a patient approach, as the Raiders prefer to maintain flexibility and Lynch probably wants to see how he feels once he's finished rehabbing from October groin surgery. He's likely deciding between another year with the Raiders or retirement, as there hasn't been any suggestion the 32-year-old running back is interested in playing for a different team. Money may also be a factor, given his status as an unrestricted free agent. Raiders coach Jon Gruden said he is still unsure if Lynch (groin) intends to continue his football career, Michael Gehlken of the Las Vegas Review-Journal reports. 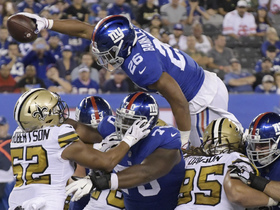 Analysis: The 32-year-old running back was placed on injured reserve Oct. 22, finishing his 11th NFL season with 90 carries for 376 yards (4.2 average) and three touchdowns. He probably still has something to offer, but a third season with the rebuilding Raiders may not sound too appealing even if he enjoys playing in his hometown. Lynch will turn 33 in April and is scheduled to become an unrestricted free agent in March. Lynch (groin) won't be eligible to return from injured reserve this season after the Raiders used their second and last designated-for-return spot Thursday on offensive tackle Donald Penn (leg), Ian Rapoport of NFL Network reports. Head coach Jon Gruden said Monday that he still doesn't know if Lynch (groin) will be able to return this season, Paul Gutierrez of ESPN.com reports. Coach Jon Gruden isn't confident Lynch (groin) will return this season, Scott Bair of NBC Sports Bay Area reports. "I don't know, Gruden said Monday. "I would say it would be very difficult, but I'm never going to shut the door with a guy like that." Lynch underwent surgery Oct. 18 to repair his groin and is hopeful to return form injured reserve when first eligible Week 16 against the Broncos, Jordan Schultz of ESPN reports. 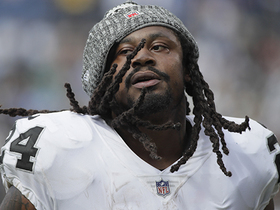 The Raiders placed Lynch (groin) on injured reserve Monday, the team's official site reports. Lynch (groin) is expected to be sidelined for at least one month after undergoing an MRI earlier this week, Ian Rapoport of NFL Network reports. Rapoport relays that the Raiders view injured reserve as a possibility for Lynch. Coach John Gruden said the Raiders are "concerned" about the health of Lynch's groin, Matt Kawahara of the San Francisco Chronicle reports. Analysis: Gruden called the injury a "strain," which could stem from his groin issue on the team's Week 1 injury report. In the midst of their bye week, the Raiders will continue to evaluate Lynch with the hope that he'll be OK for their next game, Oct. 28 against the Colts. If he ultimately needs some time off, Jalen Richard would be next in line for touches out of the backfield. Beyond Richard, Doug Martin and DeAndre Washington are the remaining RB options. Lynch accounted for 45 rushing yards on 13 carries and added three receptions for 14 yards during Sunday's 27-3 defeat to Seattle. Lynch (hip) does not carry a Week 6 injury designation vs. the Seahawks. Analysis: Lynch was limited at practice this week by a hip issue, but it won't stop him from playing Sunday in London. 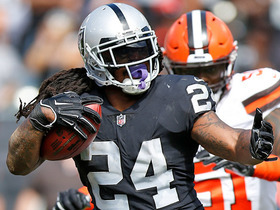 He's coming off his quietest game of the season -- nine carries for 31 yards in a 26-10 loss to the Chargers in Week 5 -- but Lynch still led the Raiders' ground attack, and his low volume was game-flow driven. A rebound Week 6 seems probable, with Lynch no doubt looking forward to turning in a good showing against his former team. Lynch was listed as a limited participant at Wednesday's practice due to a hip injury rather than a shoulder issue, Michael Gehlken of the Las Vegas Review-Journal reports. Analysis: Lynch was listed with a groin injury for Week 1 and a shoulder injury the past four weeks, typically logging limited practices rather than being held out altogether. He should be fine for Sunday's revenge game against the Seahawks in London as he looks to bounce back from a disappointing nine-carry outing in an ugly Week 5 loss to the Chargers. As always, Lynch's workload will depend on the Raiders' ability to keep the game at least somewhat competitive. Lynch (shoulder) was a limited practice participant Wednesday, Matt Kawahara of the San Francisco Chronicle reports. Lynch gained 31 yards on nine carries and 10 yards on two receptions in Sunday's 26-10 loss to the Chargers. 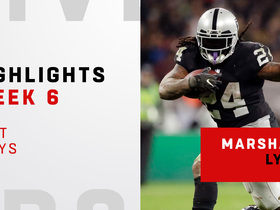 Analysis: Lynch finished with season-low marks for carries, touches and yards as the Raiders ran just 49 plays and were forced to abandon their rushing attack after halftime. The 32-year-old has otherwise enjoyed a surprisingly consistent season, scoring three times in five games while averaging 80 scrimmage yards and 2.4 catches for a bad team. Lynch will face his former club in Week 6 when the Raiders host the Seahawks. Lynch (shoulder) doesn't carry an injury designation into Sunday's game against the Chargers after logging limited practice sessions Thursday and Friday. Lynch (shoulder) was removed from the Raiders' injury report Friday, indicating he'll be ready to play Sunday against the Chargers, Michael Gehlken of the Las Vegas Review-Journal reports. Lynch (shoulder) was limited at Thursday's practice. Analysis: Lynch is tending to a shoulder injury for a fourth consecutive week. In the Raiders' previous three games, he racked up 311 yards from scrimmage and two touchdowns on 65 touches, a workload that he'll aim to uphold Sunday against the Chargers, assuming he's active. Lynch (shoulder) returned to practice Thursday, Michael Gehlken of the Las Vegas Review-Journal reports. Analysis: There's a solid chance he'll be listed as a limited participant, but Lynch's return to the field Thursday suggests that he'll be a go Sunday against the Chargers. 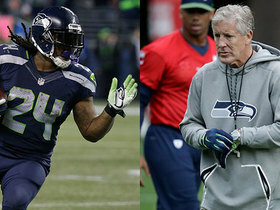 Lynch was held out of Wednesday's practice with a shoulder injury, Matt Schneidman of The San Jose Mercury News reports. Analysis: Lynch was listed with the same injury last week prior to piling up 157 scrimmage yards in a 45-42 overtime win over the Browns. With no report of a setback, he'll likely return to practice Thursday as the Raiders prepare for a Week 5 matchup against the Chargers. Lynch didn't participate in practice Wednesday, Michael Gehlken of the Las Vegas Review-Journal reports. Analysis: Lynch has been limited at practice at times this season, but Wednesday's practice is his first missed session. The Raiders should clarify later Wednesday whether Lynch is dealing with an injury of if his absence simply amounts to a maintenance day. Lynch recorded 130 yards on 20 carries and caught three passes for 27 additional yards during Sunday's 45-42 overtime win over the Browns. Lynch (shoulder) does not carry an injury designation for Sunday's game against the Browns, Michael Gehlken of the Las Vegas Review-Journal reports. Analysis: Lynch, who has scored a touchdown in all three of Oakland's games to start the season, figures to see a solid amount of volume Week 4, having averaged 16 carries a game thus far. His 170 rushing yards rank 16th in the NFL heading into the weekend, while Beast Mode has also chipped in seven catches (on eight targets) for 33 yards. Lynch (shoulder) was a limited practice participant Wednesday, Matt Schneidman of The San Jose Mercury News reports. Analysis: Lynch seems to be falling into a routine of limited practice participation to avoid aggravating a minor shoulder injury. Despite being listed on the injury report each week, he has earned double-digit carries and a rushing touchdown in every game this season. There is still cause for legitimate concern, as Lynch's failure to break off a run longer than 11 yards has left him with an underwhelming mark of 3.5 yards per carry. Lynch carried 19 times for 64 yards and a touchdown during Sunday's 28-20 loss to the Dolphins. He also caught three passes for an additional 22 yards. Lynch (shoulder) does not carry a Week 3 injury designation. Analysis: Lynch was limited at practice this week, but he'll tough things out Sunday against the Dolphins. Beast Mode has logged 29 carries for 106 yards and a pair of TDs in two games to date, while adding four catches for 11 yards. Doug Martin (11 carries for 44 yards) is on hand to spell him, and Jalen Richard provides change-of-pace work, but Lynch remains a fantasy consideration as the Raiders' lead back and top goal-line option. Lynch (shoulder) remained limited at practice Thursday. Analysis: We'd expect Lynch to be a go for Sunday's game against the Dolphins, a notion that would be confirmed by his return to a full practice Friday and subsequent removal from the Raiders' Week 3 injury report. Analysis: Lynch was also listed with a shoulder injury last week, managing a limited practice Wednesday before upgrading to full participation Thursday and Friday. There isn't any reason to believe he's in danger of missing Sunday's game in Miami. Lynch rushed 18 times for 65 yards and a touchdown and added three yards on two receptions in Sunday's 20-19 loss to Denver. Analysis: Lynch plunged into the end zone for a one-yard score to give Oakland a 12-0 lead just before halftime. His twenty touches are an excellent sign after the 32-year-old battled an illness Week 1 and a subsequent shoulder injury leading up to the matchup with Denver. The Cal product also saw two-thirds of the carries as Doug Martin and Jalen Richard rushed just nine times combined. Lynch will continue to be the Raiders' bell cow Week 3 at Miami. Lynch (shoulder) practiced in a full capacity Thursday, Matt Schneidman of The San Jose Mercury News reports. Lynch was listed as a limited participant at Wednesday's practice due to a shoulder issue, Matt Schneidman of The San Jose Mercury News reports. Analysis: Lynch reportedly fell ill during Monday's 33-13 loss to the Rams, perhaps explaining why he only took 11 carries, though a large deficit after halftime was probably the prevailing factor. He's now dealing with a shoulder injury as the Raiders begin preparation for Sunday's game in Denver. Lynch's ability to participate in any capacity suggests he's on track to play in the contest, but it will at least be worth monitoring when the Thursday and Friday injury reports are released. Raiders head coach Jon Gruden said Lynch "had a little bout of sickness" after the team's initial offensive drive in Monday's 33-13 loss to the Rams, Paul Gutierrez of ESPN.com reports. Analysis: The unspecified illness at least partially explains why Lynch handled only 11 carries in the season opener, less than half of the team's total of 23. Assuming he makes a full recovery from the ailment, Lynch will most likely take on a larger portion of the backfield workload in Week 2 against the Broncos, but due to the limited time off between games, it wouldn't be surprising if his practice reps were managed carefully early in the week. Lynch rushed 11 times for 41 yards and a touchdown while catching both of his targets for eight more yards in Monday's 33-13, Week 1 loss to the Rams. Analysis: Lynch capped off the game's opening drive with a 10-yard touchdown, but that ended up being his best run of the night. It's discouraging that he finished with just 11 carries, as this game was actually tied 13-13 prior to the final play of the third quarter. Jalen Richard and Doug Martin combined for nine carries, with Richard also adding nine receptions. Although Lynch (groin) was limited at Saturday's practice, he is absent from the injury report heading into Monday's season opener against the Rams, Matt Kawahara of the San Francisco Chronicle reports. Analysis: Lynch's limited role at Saturday's practice is likely the result of the Raiders looking to ensure he is at full strength come Monday night. His matchup against the Rams' rugged defensive line does not figure to be advantageous, but he is expected to see a healthy workload assuming he avoids any setbacks. Lynch (groin) remained limited at practice Friday. Lynch was limited in Thursday's practice due to a groin injury, Matt Schneidman of The San Jose Mercury News reports. Lynch drew the start during last Friday's preseason win over the Packers, but logged just two offensive snaps and didn't record a touch. Raiders coach Jon Gruden said he doesn't need to see Lynch play a lot in Friday's preseason game against Green Bay, Vic Tafur of The Athletic Bay Area reports. Analysis: Gruden said the same of Doug Martin, hinting that the coach wants to use Friday's contest to sort out the battle between Jalen Richard, DeAndre Washington and Chris Warren for what likely will be one or two roster spots. Lynch had his only carry in the first week of the preseason -- a 60-yard touchdown -- wiped out by a holding penalty, and he didn't play at all in Saturday's loss to the Rams. The aforementioned long run suggests he's already geared up for Week 1. The Raiders will rest Lynch for Saturday's matchup with the Rams, Michael Gehlken of the Las Vegas Review-Journal reports. Analysis: The Raiders play the Rams again in their season opener, so head coach Jon Gruden has opted to rest several starters, including Lynch, in order to not give away any of their game plan. Look for the running back to get some reps next week against the Packers. Lynch agreed to reduce his 2018 salary by $500,000 in exchange for having most of the remaining money on his contract guaranteed, Tom Pelissero of NFL.com reports. Analysis: The new contract ensures Lynch will stay with the Raiders in 2018, ending any rumors that the recent signing of Doug Martin might inspire the team to release its other hometown hero. After coming out of retirement, the 31-year-old proved last season that he's still a capable lead back, overcoming a slow start to finish with 207 carries for 891 yards (4.3 average) and seven touchdowns in 15 games. Martin merely appears in line to compete with Jalen Richard and DeAndre Washington for backup work. Lynch will receive his $1 million roster bonus Sunday and remain with the Raiders for the 2018 season, Ian Rapoport of NFL Network reports. Analysis: The Raiders mulled their options over the first few days of free agency and opted to stick with Lynch for 2018 while also adding former Buccaneer Doug Martin. Lynch rushed 207 times for 891 yards (4.3 average) and had 20 receptions for 151 yards and seven total touchdowns for the Raiders in 2017, and appears slated to be the team's lead back again for the upcoming season. Lynch seems to have the support of new head coach Jon Gruden, but that doesn't necessarily mean the running back will be back in Oakland for 2018, Michael Gehlken of The Las Vegas Review-Journal reports. New offensive coordinator Greg Olson is in the process of evaluating the Raiders' skill personnel, including Lynch, ESPN's Paul Gutierrez reports. Lynch rushed for 101 yards on 19 carries and added two receptions for 18 yards on three targets in Sunday's loss to the Chargers. He finishes his 2017 campaign with 207 carries for 891 yards and seven touchdowns to go along with 20 catches for 151 yards on 31 targets. Lynch rushed 25 times for 95 yards but lost a fumble in Monday's 19-10 loss to the Eagles. Analysis: Lynch also lost three yards in the passing game despite catching two of three targets. On the whole, it was a mixed performance from the veteran, even though his volume of touches allowed him to post his second-highest rushing yardage total in a game this season. In Week 17, Lynch will face the Chargers, against whom he rushed for 63 yards on 13 carries earlier this season. Lynch rushed 16 times for 76 yards while catching three of four targets for 16 yards during Sunday's 20-17 loss to the Cowboys. Lynch rushed seven times for 61 yards and a touchdown in Sunday's loss to the Chiefs, adding one reception on two targets for three yards. Analysis: Lynch notched just eight touches as the Raiders played from behind for a majority of Sunday's contest, while quarterback Derek Carr shouldered the load with 41 passing attempts. Despite his limited volume, Lynch managed to find the end zone on a 22-yard touchdown run in the fourth quarter, also averaging a healthy 8.7 yards per carry on his seven rushing attempts. He's now scored five touchdowns in Oakland's past five games, so he'll look to maintain the momentum in Week 15 against the Cowboys. Lynch rushed 17 times for 101 yards and a touchdown in Sunday's 24-17 win over the Giants, adding two catches on three passing attempts for twenty yards. 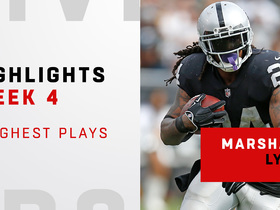 Analysis: It was Lynch's first 100-yard rushing performance of the season, and it came in large part thanks to his breaking a 51-yard touchdown on the Raiders' first drive of the game. The 31-year-old's usage seems to be trending up, with back-to-back weeks of at least 19 touches, after seeing more than 13 just once since Week 1. He'll try to keep the momentum going against Kansas City in Week 14. Lynch doesn't carry an injury designation for Sunday's game against the Giants after returning to a full practice Friday. Analysis: Lynch's absence from practice Thursday was not injury-related. 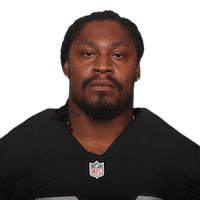 With the Raiders' wideout corps minus Michael Crabtree (suspension) and Amari Cooper (ankle/concussion) this week, Lynch -- who has totaled 51 carries for 191 yards and three touchdowns over his last three outings -- could be counted on heavily by his team Sunday. Lynch's absence from Thursday's practice was not injury-related. Analysis: Assuming he returns to the field Friday, Lynch could be on track for a busy Sunday against the Giants, with the Raiders likely to head into the weekend with a wideout corps lacking in star power due to Michael Crabtree's suspension and Amari Cooper's (concussion/ankle) iffy Week 13 injury status. Lynch (undisclosed) wasn't spotted at the start of Thursday's practice, Michael Gehlken of the Las Vegas Review-Journal reports. Analysis: Added clarity on what, if anything, is ailing Lynch, should arrive upon the release of Thursday's official practice report. With a short-handed wideout corps likely in play this weekend, the Raiders could well go run-heavy against the Giants on Sunday. So far, there's nothing to suggest that Lynch's Week 13 status is in any peril, but we'll let you know if that changes. Lynch ran 26 times for 67 yards and a touchdown in Sunday's 21-14 win over the Broncos. He also caught all three passes thrown his way for 44 more yards. Lynch rushed 11 times for 67 yards in Sunday's 33-8 loss to the Patriots. He also added 10 yards on his one reception. Lynch carried 14 times for 57 yards and two touchdowns during Sunday's 27-24 victory over the Dolphins. 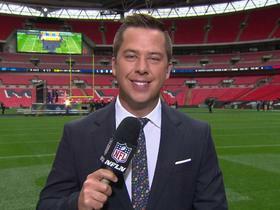 NFL Network's Ian Rapoport details the latest information on the injury to Oakland Raiders running back Marshawn Lynch. Oakland Raiders running back Marshawn Lynch, Seattle Seahawks head coach Pete Carroll and more send condolences after Seahawks owner Paul Allen's passing. Watch Oakland Raiders running back Marshawn Lynch's best plays vs. his former team, the Seattle Seahawks at Wembley Stadium in London, England. 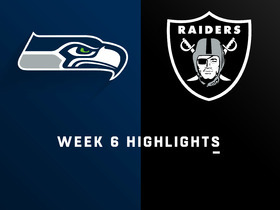 Watch the game highlights from the Week 6 matchup between the Seattle Seahawks vs. the Oakland Raiders at Wembley Stadium in London, England. 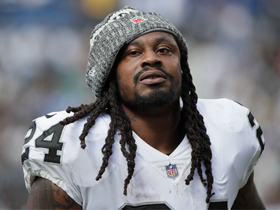 NFL Network's James Palmer previews Oakland Raiders running back Marshawn Lynch game vs. his former team. The "Good Morning Football" crew talks about Raiders running back Marshawn Lynch and the expectations of him facing the Seahawks on Sunday. 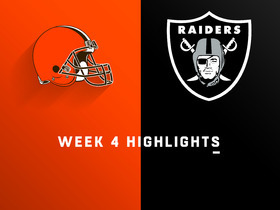 Watch Oakland Raiders running back Marshawn Lynch's toughest plays against the Cleveland Browns in Week 4 of the 2018 NFL season. Oakland Raiders running back Marshawn Lynch punts the ball after his run play was whistled dead.